Here is one of the most iconic structures in Delaware. This landmark, located at 20 West Central Avenue, was built in 1878 as the Delaware County Sheriff’s Residence and Jail. Shown in the photo are Delaware County Historical Society volunteers Dave Hejmanowski and Jan Fleischmann. They appreciate the beautiful architecture and history of this amazing structure and know that This Place Matters! 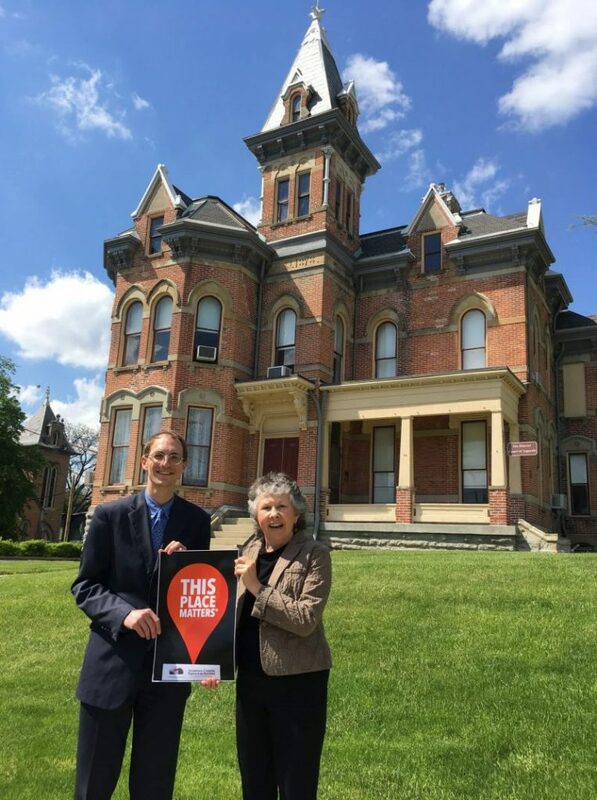 The Delaware County Historical Society is joining a national campaign by the National Trust for Historic Preservation, called “This Place Matters”, that encourages people to think about preservation efforts in their community. During the month of May – National Preservation Month – we are asking everyone to think about what places matter to them. Then share what places matter to you by posting a photo of the place with a This Place Matters sign. It’s easy to participate get the details and join in. Society Volunteers Jan Fleischmann and Roger Koch were part of an NBC4i TV news feature about this historic structure. The feature includes video views inside the old jail and a discussion of how the county wants to preserve the history while re-purposing the building.